Just 13km southeast of Kraków’s city centre, in a small and unassuming grassy valley in the town of Wieliczka, one of southern Poland’s undisputed cultural and historical gems extends more than 300 metres into the salt rock veins of the earth below. For more than seven centuries the Wieliczka Salt Mine has been a factory of superlatives, now hailed as the world’s longest active salt mine, home to the one of the world’s oldest active business ventures (the Żupy krakowskie salt works of Kraków), and perhaps the world’s most startling example of industry meets art. Since the Slavic settlers of medieval Poland first discovered the presence of rock salt in Wieliczka in the late 1200s, it has been the site of a phenomenal industrial undertaking that has seen the mining of almost 300 kilometres of navigable tunnel. What’s more, this subterranean labyrinth was also the unlikely blank-canvass for centuries of some of Europe’s most raw artistic expressions; from chiselled salt-rock statues that echo of Tolkien-esque fantasy, to elaborate and awe-inspiring religious projects that can amaze the engineer just as much as the art lover. The entrance chamber is a dark and cool shaft of more than 100 meters, in which visitors descend nearly 400 steps to reach level 1 of the mines, the beginning point of the tour that takes you through some impressive chambers cut deep into the rock. From the crudely cut statues of mythical figures, to the thin, dangling natural salt stalactites so aptly called ‘spaghetti’, there’s plenty to see as you descend. What’s more, the air is a cool and refreshing constant 14 degrees Celsius, and there’s a pleasant lingering, natural salt taste in the air from beginning to end. 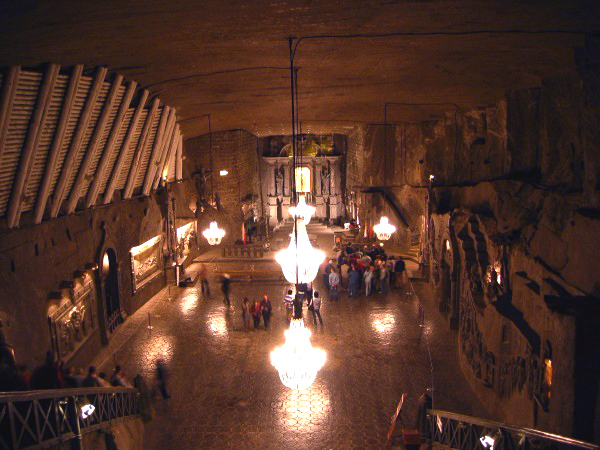 But, of the 2,400 chambers that litter the tunnels, the mine’s magnum opus is the awesome central Chapel of St. Kinga. Dedicated to the legendary Princess Kinga of Hungary, who is said to have brought salt mining to Poland, after she miraculously cast her engagement ring (which she had only recently received as a keepsake from Prince Boleslaw of Kraków), into a mine in modern day Romania, only to retrieve it from the ground in Wieliczka after commanding the local miners there to dig in a hitherto unknown spot. Today, the mine’s stunning central chamber and working Catholic chapel is dedicated to Kinga’s miracle, which not only astounded the miners, but pointed the way to the rich salt veins that ran their way under Wieliczka. You can book tickets online for day trips to Wieliczka Salt Mine including transport to and from Krakow. The central Chapel of St. Kinga, is a remarkable feat of engineering that is decorated with sculpted religious murals cut into the rock face, all lit with the meticulously crafted chandeliers that are themselves, creations of rock salt. What’s more, the chapel’s cavernous shape, low ceilings and cold, hexagonal cobbled floors are a cocktail that have led many visitors to hail it as the best enclosed acoustic space in the world. The artistic scope of this subterranean maze is truly astounding. From a life size statue of Kraków’s own venerated, ex-pope John Paul II, to a salt sculpted replica of Da Vinci’s Last Supper, the undertaking at Wieliczka is one that any visitor to Kraków simply cannot afford to miss. See our photo walkthrough of what it’s like in Wieliczka Salt Mines and book tickets online for day trips to Wieliczka Salt Mine, including transport to and from Krakow.